Keystone is a ski resort. At the base of Keystone Mountain various 'neighborhoods' of primarily ski condos have developed since 1970 when the ski area was founded by Max and Edna Dercum, who had already started Arapaho Basin and who owned Ski Tip Ranch. Ski Tip had served as the lodging for A-Basin since it was founded in the 1940s, but the opening of this new mountain was going to bring far more people to Keystone than the Dercums could feed and house. Lodging for Keystone Resort quickly developed, starting around the base of the first lift. 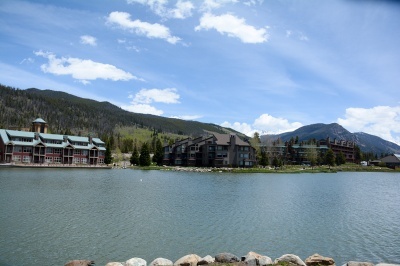 This core area of Keystone is called Mountain House, after the main warming house, and is primarily condo with great ski-in/ski-out convenience. From this core, development spread west and north. Wild Irishmen was the next set of condos built in 1971, in what is now thought of as West Keystone. Close to the base area, the west side is mainly multi-story condos, and more of these types of lodging can also be found further west along Soda Ridge and Wild Irishman roads. As the meandering roads of Keystone go farther west, density decreases. The large single-family homes of Keystone Ranch spread out in this more westerly part of Keystone, surrounded by two golf courses. Trails abound and access to the national forest is easy from here, while a resort-run shuttle is all that homeowners needed to get to the lifts. The neighborhood north of Mountain House, built around the Keystone Lodge and Conference Center is called Lakeside. This little 'hood stands out because of its big-scale convention services but also for its large-scale lake - a skating rink in the winter. 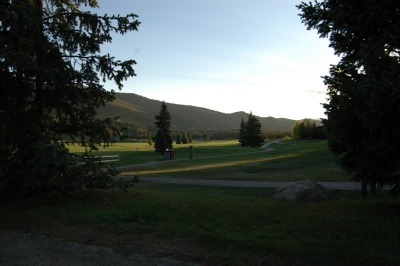 Across Highway 6 - an area known as North Keystone offers more lodging, tennis and additional convention buildings. Along the highway are some good, old-school bars that offer great music in the evening and a colorful atmosphere. More mundane services like gas stations can be found here as well. The area around Ski Tip Ranch, like the more outlying westside, has developed into more of a single-family and townhome neighborhood, and is one of the last areas to be developed close to the base of Keystone Mountain. In the mid 1990s, River Run Village and the River Run Gondola sprung up between Lakeside and East Keystone (around Ski Tip). River Run Plaza is the site of several seasonal festivals, and any real estate for sale in River Run can brag about prime ski-in/ski out convenience. River Run properties also offer easy access to its ground floor shopping and restaurants. Not bad on access to the national forest and the rest of the county via a resort-wide shuttle and free bus service, either. The ski resort founded by Max and Edna Dercum began on Keystone Mountain (renamed for them) and was half-owned by Ralston Purina, the dog food makers.The resort has since grown to three peaks and five bowls. Now, the geographically-largest resort in Summit County, Keystone has more than 116 trails, 15 lit for night skiing, 20 chairlifts, 2 gondolas and more than 1600 lodging units. The restaurant at Keystone Ranch is often named as the best in Summit County, and is just one of 34 restaurants. Newly refurbish, Lakeside includes a five-acre outdoor skating rink, which is the largest zamboni-maintained rink in North America, and its open at night too. So is the A-51, an on-mountain terrain park. In the 1940s, Max Dercum had been a fire lookout for the forest service in the nearby mountains and imagined that Keystone Mountain would be idea terrain for alpine skiing. He bought the ranch and renovated Ski Tip Lodge, near the base of it. Skiing in the county started up Loveland Pass Road, when Dercum cleared a few runs at what is now Arapahoe Basin, with the help of several French Canadians and Colorado investors. From the one lodge to many, the skiing experience also grew and today Keystone Resort includes the original mountain, which has been renamed Dercum Mountain, the Outback and North Peak. Five other bowls are also part of the skiing experience at Keystone, which includes several run that are lit for night skiing - the only ski area in the county so equipped. 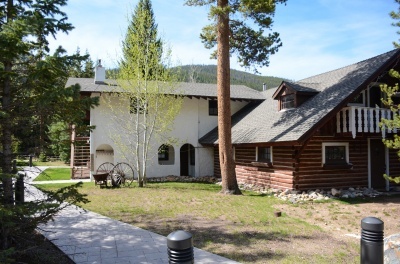 Keystone started as a travelers junciton point, with Ski Tip Lodge as stagecoach stop. It was the end of the line of the Denver & Rio Grande Western railroad which came from Denver, up South Park to Leadville then into Dillon and the mines of Summit County. From Keystone, travelers could make a long, horse-drawn trip to the railroad on the other side of the Continental Divide, which at its most westward extension reached Silver Plume, still about 30 miles away from Keystone over high mountains. Plenty of mining activity was going on all around this town, which is one reason the train came to Keystone, although it came late. Until 1882, the stagecoach was the only option from Georgetown to Leadville and Keystone was an important way station. The Denver, South Park & Pacific (as the South Park Branch of the Union Pacific) in 1884 completed another line from South Park over Boreas Pass into Breckenridge, and to the headwaters of the Snake River, then up Tenmile Canyon to Leadville. The Snake River begins above Keystone in the mountain valleys around Arapahoe Basin and consolidates its forks at Keystone running along the base of the ski mountain until it empties into the Blue River - a tributary of the Colorado River - in Lake Dillon. 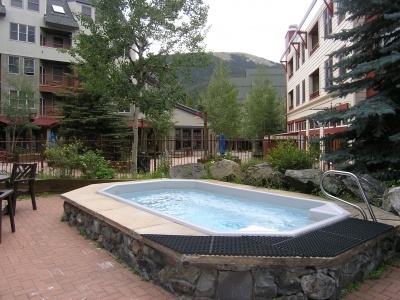 Luxurious Ski-In/Ski-Out accommodations, closest to gondola, with on-premise Heated Pool and only a short walk to all of River Run Village's restaurants, shopping, nightlife and seasonal festivals.